Over the last week, there’s been quite a bit of news swirling around Rupert Murdoch’s empire, including, most recently, the now infamous LulzSec’s pwnage of The Sun, News Corp’s daily tabloid newspaper. On Monday, the network of merry hacktivists hacked into The Sun, pinned a fake news story about Murdoch’s supposed death on the homepage, redirected the site to its Twitter page, and brought down a number of other News Corp and News International websites — all in one fell swoop. If that weren’t enough, on Thursday, the hacker known as “Sabu” (who is reportedly affiliated with LulzSec and Anonymous) claimed to have 4GB worth of emails, or “sun mails” that might “explode this entire case” that were lifted during the hacking. Sabu was, of course, referring to the ongoing News Corp/News Of The World scandal, in which top executives have been accused, some arrested (and on trial) for illegal phone tapping of everyone from celebrities to murder victims. It has since been unclear whether or not LulzSec would be releasing some or any of those emails to the public, though AnonymousIRC, for one, indicated via Twitter they may not. While that assertion remains intact, we’ve just discovered this site: “MurdochLeaks.org“, which appears to be the landing page where Lulzsec and/or Anonymous may dump none, some — or all — of its News International email loot. These hackers sure love Twitter. Again, to be clear, at this point it’s not evident who owns the site, but we’re looking into it. (Probably Louise Boat.) And, with “leaks” in the headline, all signs point toward this being a Lulzsec/Anon. production. Should the site go live, we will of course update with more. Update: The page is now live. 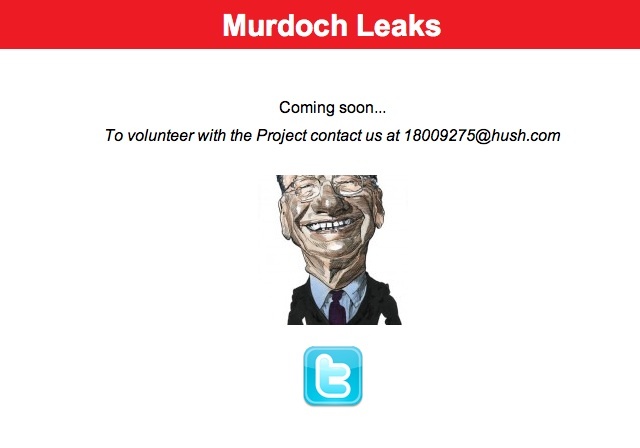 While we were correct in reporting that this is a site linked to the News Of The World scandal, it appears the Murdoch Leaks Project is simply looking to collect tips or “evidence of wrongdoing” in regard to the case — in an effort to enhance the fourth estate’s coverage (or lack thereof) of the case. A Wikileaks, specifically for News International. While it is still not clear who is behind this, and murdochleaks.org makes no mention of it, the domain is registered to Cinipac IBC, a German backup, hosting, and anonymous communication service. However, it is unlikely the anonymizing service is behind the site; instead, it is more likely that the service is simply being used as the tool to protect the anonymity of those making submissions (and those behind the site). So, it could very well be that we were incorrect in making a connection to LulzSec, and we’ll share when we know for sure. It could just be the project of some Julian Assange fans, or former journalists, or LulzSec-ers looking to find a way to share potentially incriminating information (procured in equally incriminating ways) in such means that would make the information viable in court. But that is just speculation, and they say that they will not publish anything themselves. More to come.